Walk into your back yard, kneel down, and snap a photo of a flower in your garden…or capture a shot of your grandchildren playing with a football. Did you know that these photos could earn you $25…$50…even $150 or more for each one? Imagine if, every time you went on vacation, with your camera in tow, you could make up to $800 for those pictures you snap. There is no great secret to breaking into photography—even if you have no experience and only use a simple point-and-shoot camera, it can still be a way to fund a new, more relaxed, and fun lifestyle. Photos are used everywhere…newspapers, magazines, billboards, websites, technical manuals, and almost any published material. Someone has to take those pictures. 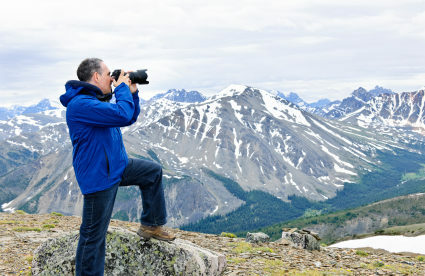 Why Become a Travel Photographer? Photography really can open up the world to you. As a “working” photographer, you can pick-up-and-go any time you choose…get on a flight to any number of far-flung destinations…and enjoy the freedom of the photographer’s life. See the articles below for more information on ways to earn a living as a photographer. Why shouldn’t that someone be you? Join our Fund Your Life Daily e-letter today, and you’ll hear from us five times a week, telling you about ways to earn income that lets you live anywhere, travel anytime… and give you the funds to make your overseas dream real. Sign up to the Fund Your Life Daily e-letter now and we’ll send you a FREE report about photography and other ways to earn money abroad. Simply enter your email below and we’ll send you this free report: Fund Your New Life Daily With These 6 Portable Careers. Last November I turned 10 years old as a travel photographer (in human years I am now 55). Before that, I practiced law for almost 20 years. I changed careers about 20 years before I intended to, but being a full-time travel photographer has been a fulfilling experience; I no longer think of myself as a lawyer.